This webinar was given by Ron Eslinger just before the 2014 NGH hypnotist national convention. The course was a success! 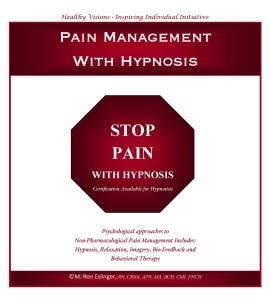 The bonus materials he mentions in the video are no longer available, but for a limited time if you sign up you will get a free pain management eBook by Ron Eslinger and a couple of great videos on using hypnosis for pain management in your inbox over the next few days. Join Ron Eslinger on a short introduction to his successful anger management workshop. From middle schools to corporations to jails this program has helped participants learn to control their anger. This program will train to you teach clients or groups how to realize and control their anger using proven hypnosis techniques. The trigger phase happens when we perceive a threat or loss, and our body prepares to respond. In this phase, there is a subtle change from an individual’s normal/ adaptive state into his stressed state. In the escalation phase, there is the progressive appearance of the anger response. In this phase, our body prepares for a crisis after perceiving the trigger. This preparation is mostly physical, and is manifested through symptoms like rapid breathing, increased heart rate and raised blood pressure. As previously mentioned, the escalation phase is progressive, and it is in the crisis phase that the anger reaction reaches its peak. In the crisis phase our body is on full alert, prepared to take action in response to the trigger. The recovery phase happens when the anger has been spent, or at least controlled, and there is now a steady return to a person’s normal/ adaptive state. In this stage, reasoning and awareness of one’s self returns. The depression phase marks a return to a person’s normal/ adaptive ways. Physically, this stage marks below normal vital signs, such as heart rate, so that the body can recover equilibrium. Pain is a perception and a protective mechanism. Therefore if pain is needed to protect us then we can change our body’s physiological response to it. Phantom Limp Pain (PLP) is the sensation that an amputated limb or removed organ is still attached to the body. Up to 80% of all amputees experience Phantom Limb Pain. The symptoms of this syndrome can range from mild to severe. How can Phantom Limb Pain be treated? Properly using hypnosis is to deal with the cause not the symptom of phantom limb pain and proves to be one of the most successful forms of treatment for many of those who suffer from the loss of a limb. What ever the mind has experienced it can recreate. A person who is good at creating hypnosis and we are talking between 50 to 80% of the population. The first objective is getting rid of the fear and interrupting the fight or flight response. Letting a person in hypnosis remember what it felt like when an arm or leg fell asleep or what numbness was like after leaving the dentist allows perceptual biological changes in the body. I had a young client with phantom limb pain after a broadside motorcycle accident. In hypnosis we discovered that after surgery a nurse ask him what he wanted to do with his amputated leg. In anger he said “Throw it in the trash” A few days later his sister ask him what the hospital did with his leg. He said “The nurse threw it away.” The sister said “Oh No if you don’t burry the leg you will have phantom limb pain.” He did for 2 years. It has been over a year since his hypnosis and his pain has not returned. I tell you this story to say that all patients that go for treatment are in a state of altered consciousness and there for very open to suggestion. What is said in the holding area or even during surgery and post-op when the patient is completely sedated can make all the difference in the world in a patient’s outcome. There are hundreds of studies that prove the value of hypnosis, but the money pales in comparison to that of pharmacology. 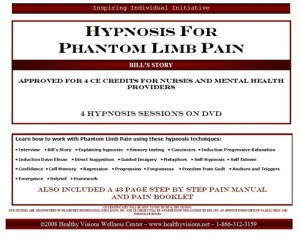 You can help relieve your patient and/or clients of Phantom Limb Pain using completely natural hypnosis and relaxation techniques. Learn more about Ron Eslinger’s Phantom Limb Pain Workshop here. Watch this preview of what you will experience and learn in this one of a kind Hypnosis Certification Training. Please change an NGH (National Guild of Hypnosis) to a National Guild of Hypnotists (NGH) in the following line. Become an NGH (National Guild of Hypnosis) Certified Hypnotist, this 100 hour certification program is offered by Healthy Visions’ American School of Clinical Hypnosis. This unique and one of a kind program teaches you to become a clinical hypnotist. Great for Psychologists, Psychiatrists, Nurses, Anesthesiologists and all those in the medical field, Physical Therapists or those wanting to become a Hypnotherapist. This program has been prior approved by the American Association of Nurse Anesthetists for 40CE credits; AANA Code Number 1025817; Expiration Date 7/31/2013. Healthy Visions is an approved provider of continuing nursing education by the Alabama State Nurses Association, an accredited approver by the American Nurses Credentialing Center’s Commission on Accreditation (ANCC). Approved for 75 CE Credits Code # 5-133-413. Pain management can be achieved with the use of hypnosis either in conjunction with medication or as a stand alone method to relieve chronic or short term pain. Using Hypnoanesthesia Ron Eslinger has been able to relieve all kinds of pain from mild discomfort to severe chronic pain. Learning methods of hypnoanesthesia can help you with your pain. Some of the worlds top hypnotists have named Ron Eslinger as the “Captain of Pain” (management). Partially due to his service as a Capt. and CRNA in the US Navy. Mostly due to his extensive work on using hypnosis to combat all types of pain. He is known as the best of the best in using hypnosis to treat pain. With over 30 years experience in medical settings working with patients in doctors offices, pediatric clinics, ER, operating room and even providing medical support to troops during the gulf war and more currently in his own hypnosis practice he has seen and helped with almost any kind of pain. The Joint Commission for Accreditation of Healthcare Organizations (JCAHO). JCAHO set standards for the assessment of pain and states that alternative non-pharmacological methods for pain management may be used by all hospitals. Video tour shot in 1986 by Captain Ron Eslinger USN, Ret. Currently a floating museum on the Camden Waterfront across from Center City Philadelphia. This course includes over 33 DVDs and CDs covering everything from stress to cancer. 33 DVDs and CDs in this course! This weight loss program was put together buy a professional hypnotherapist for other professionals, personal trainers, doctors, psychologists, therapists. Works great in conjunction with other weight loss programs (diet and exercise). But great results can be shown just using this program. If you are a personal trainer, work at a weight loss clinic, hospital or work with diabetics looking to give your clients or patients an edge on losing weight and keeping with a program this program will help you greatly! The requirements for Weight Management Certification are included with this package. Ron Eslinger’s Hypnosis for Pain Management course is to train anyone in the healthcare field to teach them simple techniques to use on their patients and clients. Learn more about this course by clicking here. To receive CE Credit for this workshop complete the application and review questions located on the Data CD with a score of 80% or higher. Healthy Visions is an approved provider of continuing nursing education by the Alabama State nurses Association, and accredited approver by the American Nurses Credentialing Center’s Commission on Accreditation (ANCC). This workshop is for professionals to learn to teach others the best practices for handling and surviving everyday stress and stressful situations. If you must train others this program is a must. Have the client clasp both hands together, making sure the palms touch. The thumbs are crossed, and stick both index fingers up like goalpost. Tell them to focus of the space between the fingers and focus on the space between the fingers only, as you repeat over and over your fingers are like magnets and coming together until they touch your fingers are magnets and they’re coming together until they touch. In reality, the fingers automatically come together and you praise their success and how that simple concentration and focus allow the subconscious mind a truly believe the fingers were magnets. However, the true purpose of this experience is to see if the fingers stay apart. If they stay apart than the client is resistant, and that needs to be explored.